TGH Aviation, based out of the Auburn Airport in Auburn CA, is proud to announce it has been awarded a multi-million dollar five year contract by the U.S. Air Force for the purpose of overhauling all Fuel Flow Transmitters, 8TJ61 Series, for the T-38 Supersonic Jet Trainers. 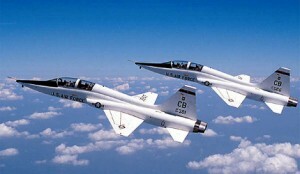 The T-38 is the primary training aircraft for the Air Force. More than 60,000 USAF pilots have trained in the T-38 since it entered service in 1961, when it was the world’s first supersonic trainer. USAF T-38 trainers are primarily used by the Air Education and Training Command for joint specialized undergraduate pilot training (JSUPT), but the aircraft are also used by the Air Combat Command for its companion training program and by the Air Force Materiel Command to test experimental equipment. “The award of this contract extension is an affirmation by the Air Force of the extraordinary service and quality of workmanship provided by the employees of TGH Aviation,” said TGH President Richard Anderson regarding the recent contract award. For more than 56 years TGH Aviation, formerly The Gyro House, has been an industry leader in flight system support. The company exudes confidence in its ability to provide best-in-class repair, overhaul and new products for a wide range of aviation needs, with the fuel flow support being at the heart of them. TGH operates four full time Fuel Flow Transmitter calibration laboratories. All tools and test equipment utilized by TGH, for the “Return to Service” of Fuel Flow Transmitters, are calibrated, certified and traceable to the National Institute of Standards and Technology (NIST). TGH uses only quality parts that are OEM or FAA approved in the completion of repair work on Fuel Flow Transmitters. The flowmeter operates on the principle that the rotation the fuel by the constant-speed inlet impeller tends to rotate the stationary outlet turbine in an amount which is proportional to the rate of fluid flow through the device measured in pounds per hour. A constant speed motor turns at 8,000 RPM, driving the inlet impeller at 206 RPM through a reduction gear. The inlet struts and inlet impeller combine to impart a clockwise rotation to the incoming fluid, which tends to turn the outlet turbine. The outlet turbine does not rotate through a complete revolution, but as the fuel passes from the inlet impeller with a clockwise spin, it causes the outlet turbine to deflect from its neutral position against the action of a spring. The angular deflection is directly proportional to the mass rate of fuel flow. The outlet turbine deflection is sensed by a synchro transmitter which is directly coupled to it, and provides a signal proportional to the rate of flow to an indicator. TGH Aviation has a well-known reputation for their precision and innovation within the aviation industry. In addition to military aircraft repair, TGH also overhauls fuel flow transmitters for high performance aviation aircraft, corporate/commuter aircraft and large commercial aircraft. For more information on TGH aviation and their capabilities please check out their website at www.tghaviation.com.